It’s 1984. The streets of Sao Paulo are abuzz with people, traffic whizzing by, the colors, the smells. A 3-year-old Raphael Conte takes it all in, king of the world atop a Honda CB125 with his father at the throttle. Rapha recalls the moment vividly, “There was no other feeling like it in the world”. “Total freedom, a tremendous adrenaline rush, man and machine one with the world”! I can relate to this as I recall a vivid memory from my childhood riding in my fathers black Pontiac Trans AM complete with a massive golden eagle on the beat up hood, Queen’s ”Another One Bites The Dust” the soundtrack to our day. Rapha’s passion for the two-wheeled wonders was instinctively oppressed by his loving if not over protective mother throughout his teenage years but the chains would only hold for so long. “It’s not until you’re between a rock and a hard place that you know your true calling”. Rapha held several jobs through the years from flipping burgers to managing a sales team for a phone company. Yes they paid the bills but as many would agree from their own experiences, they were just j-o-b’s. “I can’t say I had been passionate about any of my career choices to that point”. So far his only experience with motorcycles had been tinkering with his own bike, learning as much as he could from knowledegable friends and online forums. Over the years that followed he was forced to sell his bike to pay for a tattoo certification and bills that had managed to pile up. 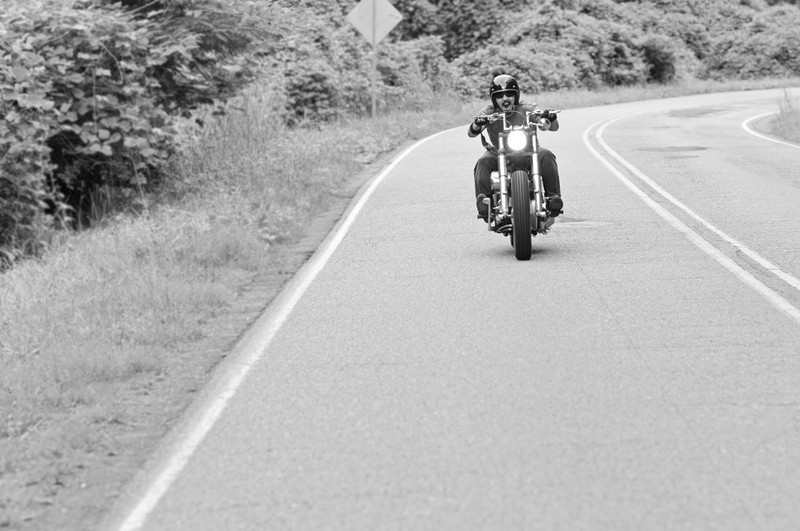 Just a few months later Rapha purchased a used motorcycle for cheap and got to work on it. “Let’s just say I polished a turd”! His hard work and dedication to his passion was suddenly starting to literally pay off. The bike turned out great and garnered a good bit of attention, so much so that he was made an offer he felt he could not refuse and ended up selling the bike. After turning a pretty profit on that bike, his hobby had unintentionally become a part-time job. So he bought, customized and sold motorcycles for a profit from a tiny two car garage at his home. After two years of successfully flipping bikes he decided to start his own business and the rest is history. In June of 2011 Conte Kustoms was open for business! Starting a business during an economic depression with very little money came with its limitations and sacrifices. The rough times meant Rapha had to fill a niche in the market that catered to the blue-collar workers. People like him, passionate about their motorcycles but on a budget. Heart can get you started but talent is what keeps it going and Rapha has talent to spare along with an attitude and graciousness that I not only admire but aspire to myself. “The era of chromed out, $50,000 themed motorcycles was over, television history”! Deciding to target the “blue collar” market with affordable, mid-sized bobbers and choppers, he went at it full-bore. After just over a year in business, Conte Kustoms is growing nonstop. With dozens of motorcycles sold throughout the country and an upcoming magazine feature, Conte Kustoms is becoming a household name. In the pipeline there is some sure to be in demand Conte Kustoms merchandise and the shop is also preparing for their biggest party yet, the first annual “Haulin & Squalin” anniversary bash! There’s definitely no stopping now, Conte Kustoms is here to stay and for good reason! “I love what I do and plan on doing this till my very last breath”! To someone I now consider a great new friend, “cheers to you Rapha, here’s to many more a Brazilian beast rolling out of that garage and into the world”!